GUISELEY chairman Gary Douglas believes the club’s new management team will bring much-needed ‘stability’ at the club. 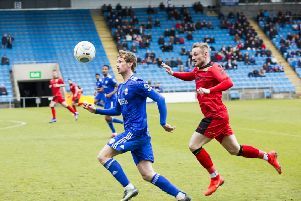 The Lions’ two-year stint in the National League came to an end last month in a season which saw them go through three managers, with Adam Lockwood being replaced by Paul Cox, who in turn was sacked in February after which former Preston North End defender Sean St Ledger took over as player-coach until the end of the season. There were some connected with the club who were keen for St Ledger to return on a permanent basis to spearhead the club’s attempt to get back up to the fifth tier at the first attempt. But Douglas and his colleagues have gone for the joint management team of Russ O’Neill and Marcus Bignot, with Paul Clayton joining them as assistant manager. “We are really excited to have the new management team in place as we look to get stability back into our club,” said Douglas on Tuesday afternoon. “We are a family club and at this point in time we need everybody connected with the club to pull together as we aim to recover from what was a really testing 12 months for the club. After a turbulent 2017-18 campaign, both on and off the pitch, the club will be reverting to a part-time basis in an attempt to consolidate under Douglas. Both O’Neill and Bignot, 43, seem to come with the requisite pedigree, having won National League North previously – O’Neill alongside Nicky Law with Alfreton Town and Bignot with Solihull Moors in 2016. Bignot’s success in the West Midlands saw him join the Mariners in November 2016, but despite a promising few months, he left the following April with Town seven points off the play-offs. He was then appointed by Chester FC in September 2017 but left in April 2018.